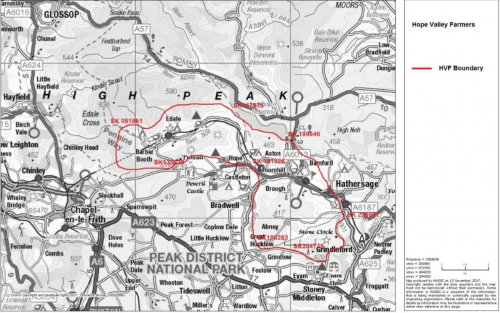 The area covered by the Hope Valley Farmers area is in the Dark Peak NCA 51. Breeding wader species are identified as a key priority, particularly lapwing, curlew and snipe. Many member’s farms support breeding / feeding populations of wader species or suitable habitat. The area contains five SSSIs and is bordered by the Dark Peak SSSI /SAC / SPA. Focusing on habitats to buffer, enhance and potentially extend designated sites will be a priority. The group will deliver against the following priority habitats: Blanket bog, upland heath, flushes (Abney and Offerton Moor, Win Hill) Lowland dry acid grassland / lowland meadows – conserving and restoring important grassland sites will be a priority through improved management and restoration. Ancient and native woodland: priority deciduous woodland sites are widespread in the HVF area and most members have woodlands on their farm. Training will focus on woodland management and establishment, signposting to CS and Woodland Trust funding to manage, enhance and extend woodlands. Riparian habitat: the River Derwent and Noe run through the HVF area and several group members own /control riverside habitat. Actions – Training on nutrient/ grazing management on riverside field to reduce diffuse pollution risk and impacts from bank erosion/poaching and linking to the work of the Severn Trent Derwent Catchment Officer (Margaret Baile) for additional support and funding. Pollinators: encouraging the establishment of herbal leys, promoting planting of and rotational cutting of hedges, allowing scrub to develop and conservation of unimproved grassland will be key actions to support pollinators. Landscape: maintenance and restoration of stone walls and hedgerows are a priority – events on management/restoration and the Hedgerow and Boundary Grant will be organised.